I bought this quite a while ago but only recently started to use it. I have to say this has become an everyday essential. The contour shade is perfect and blends out really well. The highlight shade i actually use as my under eye powder rather than a highlight as it doesn't have any shimmer in. I was recommended this a while ago as i have very oily skin and wanted something to keep me matte for longer especially with the warmer weather coming. This is medium coverage but it honestly keeps me matte all day! I am really impressed with this product. I recently included this in my Top 5 Pink Lips Post as it is a newbie to my collection which i love. It applies really well and dries matte but doesn't dry my lips out at all. I have recently started applying this after i have moisturised but before i apply my makeup. I find it stops any foundation/powder clinging to my lips and also gives a lovely subtle pink effect. This also comes in vanilla & original. I love this! It is perfect for waking up my under eyes, i mainly use this to highlight as i picked up a few shades lighter than my actually colour. I think for you to love this product it all depends on what you under eye circles are like. I tried this foundation quite a while ago hoping it would be perfect for my oily t-zone but I just didn't get along with it :( I found it really patchy on my skin and was really disappointed! I'm glad it works for you though! I love the nivea lip butters, they taste too good. Never seen the Nivea lip butter before, definitely need to keep an eye out for it. Great favourites! I want to try out the Naked Skin concealer so bad! my favourites are on my blog! I love No7's foundation, great post! I really want to try the urban decay naked skin concealer sound so good your pictures are really good too! I'm following you now, love the blog! Hope you will do the same! I've been thinking of getting a No7 foundation for a while now, might just give one a try if they've got one pale enough for me! I need to try that Urban Decay concealer! Great picks! The naked skin foundation is my holy grail! I have been wanting to try the seventeen contour palette for ages, its definitely on my list to buy next! I love Urban Decay but I wasn't away they did concealer in their Naked range. I use the Naked foundation and now I'm totally going to hunt down their concealer! 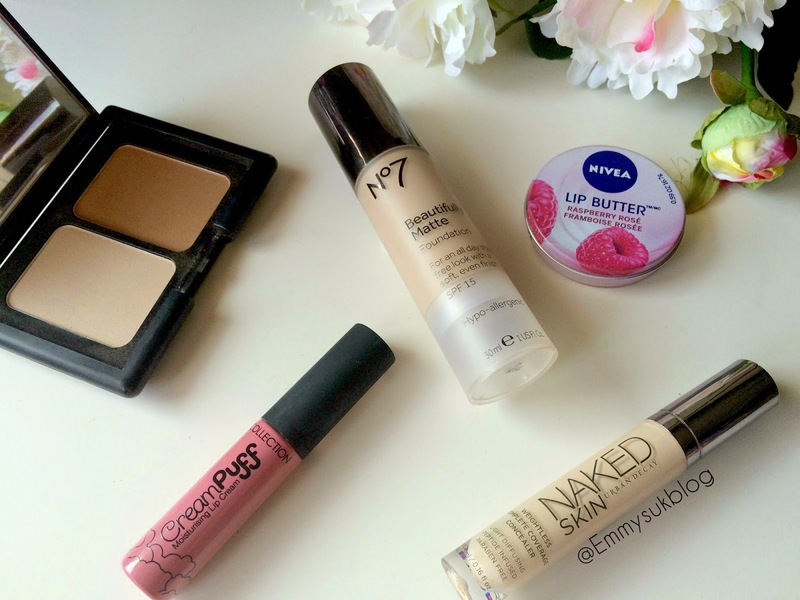 I am always looking for a foundation that will keep me from getting oily throughout the day! I'm definitely going to check out that No7 Matte foundation. Love the favorites! Hey I'm Emmy! Get cosy, grab a brew and explore my blog. It is full of Beauty & Lifestyle plus my puppy peanut and hints of baking! US Haul | Cheap UK Postage! © EmmyWritesAbout. Theme by Templates by Kate.